Permatex® Anti-Seize Lubricant is a heavy duty, high temperature lubricant that prevents galling, seizing and corrosion during assembly and assures easier disassembly. Also reduces wear in heavy pressure applications. 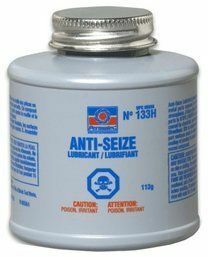 The product contains a refined blend of aluminum, copper and graphite lubricants that can be used on slow moving parts. Meets or exceed the requirements of Military Specification Mil-A-907E. pressures, such as boiler and oven parts, jet engines, and industrial turbines.